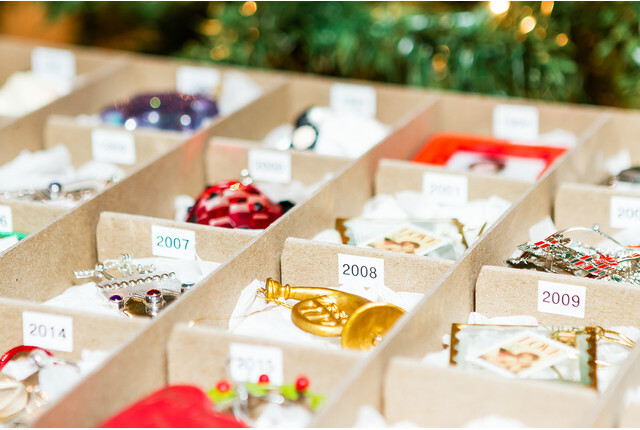 Store your favorite ornaments, collectibles, keepsakes and holiday décor in our Archival Ornament Storage Boxes. These carefully crafted boxes provide secure storage, and the archival qualities protect your holiday treasures from damage due to ultraviolet light and migrant acid. Sturdy, reinforced construction and metal corners shield your valuables from dirt, dust or breakage. Adjustable interior dividers help you customize your holiday organization solution. Archival Ornament Storage Boxes is rated 4.5 out of 5 by 35. Rated 5 out of 5 by KristinAnn from Great For Under The Bed Storage These archival ornament boxes do more than just keep my family's ornaments organized and protected, they also make packing ornaments up after the holidays a breeze. These boxes are also a great option if you need to store your ornaments under your bed. Just note that the height measurement listed in the product description is the height of each individual ornament compartment (or cell) inside the box. The height of the box itself is a little more than 0.2" taller than the interior compartment height. That means two of the 16-compartment boxes (with 4" high cells) can't be stacked on top of each other under an 8.4" bed. When stacked, they're about 8.6" high. Also, to determine what size boxes you need, I recommend spreading your ornaments out on a table the next time you dismantle your Christmas tree. Group the ornaments by size, and you'll quickly be able to see how many boxes you need and which size(s) will work best. Rated 4 out of 5 by P333 from Great purchase They are handy and secure and I love the space allotted. Rated 4 out of 5 by houstonisorganized from great archival storage box Sturdy, and easily stacked in a closet or the attic. I like the metal reinforcements of the corners of the lid and main box. The cardboard is sturdy and looks like it will last a long time. The dividers are ample, with some flexibility on interior compartment size adjustment. Rated 5 out of 5 by Citygirlstyled from Perfect for BELT storage! After seeing this box on another blog, I bought it and decided to use it to store my many belts. It's perfect!! Box is well constructed. Very sturdy and compartments are adequate size. Will be buying another soon. Rated 4 out of 5 by Organizedworld from I am very pleased! These are very sturdy storage boxes! Well built! My only problem/concern is the dividers, I split a knuckle while filling them, they are very sturdy but could benefit from softer/rounded edges, other than that they are great! They came to late for Christmas but I quickly found another, possibly better use for them: the bulbs from my outdoor string lights! I don't like leaving them up all year but also the bulbs break easily when stored! So now that is no longer a concern, easy and safe storage that stacks well in my garage! I may take a soft nail file to the dividers and soften the edges but again, I love them, truly much more sturdy and heavier than I expected! Rated 5 out of 5 by MyLAOrganizer from Thinking outside the Box! These boxes are obviously great for ornaments, but as an Organizer and one who likes to think outside the box, I chose to use these boxes for a different reason. Okay, so you know how as mothers each year you collect art and keepsakes from your children, but you are not sure the best way to preserve the items. Well, now you know! These boxes are acid free and large enough to hold all of your childrens art, memory's, cards, photos, ect. For this client I made custon labels for each school year. They look handsome and you know you are doing the right thing to preserve your memorys! Rated 4 out of 5 by Ewglass from Great but too expensive These are beautiful boxes but the price is prohibitive except when we have sale coupon. Rated 5 out of 5 by LuvContainerStoreEaston from Archival Ornament Storage Box (28 compartment) If your ornament storage is absolute chaos to the point where you dread decorating your Christmas tree, you gotta buy these boxes! I sorted my ornaments, one for each of my children, plus 2 for "family ornaments" Having each child's ornaments displayed in one box is like seeing a snapshot in time: first year, video game characters they loved, activities they enjoyed, places we've been, etc. I am so looking forward to decorating with them this year and when they get old enough and start their own families, they have a good start to their own tree and traditions! (I liked the 28 compartment size best but I did add one 16 compartment box or those large family ornaments that didn't fit.) Oh yeah, buy the shredded archival paper too; one bag did all 6 boxes with plenty left over! Rated 1 out of 5 by FishLips2 from Stinky Box the archival cardboard box looked good and seemed to be what I needed but whenI brought it home and unwrapped it, it stunk...literally it stunk - had a very foul order which stunk up not only my apt but also the car I transported it in. The store clerk also confirmed it stunk (of something like vomit) when it was returned to the Tysons Corner Store - I just hope the Manager also got ibvolved --- because anyone who got close to it would have to smell as the order was very strong - unless you like the smell of rotten cheese, then don't buy this box. Rated 5 out of 5 by PatNYC from Great storage for your very special ornaments I have purchased 7 archival ornament storage boxes. The boxes are stackable, strong and well made. The variety of sizes available make it easy to match ornament size with the correct storage size. The acid free environment will help preserve the beauty of my Christmas decorations for many years. I highly recommend purchasing for your special ornaments. Rated 5 out of 5 by Veneto1 from Great product! Well constructed product for easy storage. Good pricing! Rated 5 out of 5 by CGinVA from Ornament storage Used these for the last 6 years and 2 moves abroad. They're sturdy and I add some small packing material in each cell for an additional buffer for when it's time for a big move. Just bought some more, so far so good! 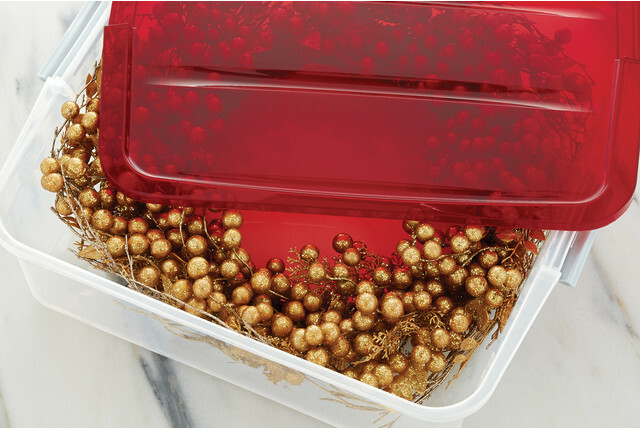 Rated 5 out of 5 by perfectioist from The real deal These storage boxes are heavy duty safe storage for precious ornaments. They are not the usual cheap cardboard that gives when the box is picked up. They exceeded my expectation. Rated 4 out of 5 by iggymama from good storage These divided storage boxes are great for holiday and collectables. Rated 5 out of 5 by SUZSKY from Strong & Sturdy These boxes are heavy, strong and sturdy. Your fragile ornaments will always be safe in these archival boxes. However, since these boxes do not seal like a plastic lidded container, they must be stored inside the home. Rated 5 out of 5 by KimB from Great Holiday Storage Nice boxes for storing tree decorations. Very sturdy. Rated 5 out of 5 by Jmel119 from very sturdy I used these boxes for my child's artwork. Very sturdy. Archival so the artwork will last the test of time. Rated 5 out of 5 by brownlet from Christmas Gift My husband bought this box and filled it with 'starter' ornaments as a gift to our family for our first Christmas as a family of 4. It meant a lot to me and I know it will bring a lot of happiness to us for many years. It is very solidly constructed and will keep our little ornaments protected and clean each year. It is easily stored and is attractive to look at. Overall a great product. Rated 5 out of 5 by PckerFan from Durable & Flexible Spacing These ornament boxes are perfect. I enjoy that they come in various sizes to fit ALL of my ornaments. They are durable and stack perfectly on my basement shelving, making decorating the tree a breeze every year! Rated 5 out of 5 by nolalegal from fantastic purchase Over the years, I have invested thousands of dollars in european Christmas ornaments, and I treasure the Czechoslovakian ornaments and tree toppers which I have inherited from my great grandmother and grandmother. To preserve these ornaments I have purchased a number of archival, acid free containers over the years, but none as sturdily built or thoughtfully designed as these. My ornaments have survived the ravages of time, New Orleans festivities, and Hurricane Katrina. Now I know that they are even more protected than before, and they are certainly easier to access! Thank you Container Store! These boxes hit every need...convenience, form, and function. Rated 5 out of 5 by Misdisorganized from Best purchase ever! This was the best purchase I have made in years!!! Now I don't have to worry that my ornaments will break and I save so much room!! The boxes are sturdy and have a slick appeal! Rated 4 out of 5 by Fergie52 from Nice Purchase I have always looked for storage compartments for ornaments when my husband suggested I look on-line at The Container Store. I do like these, however, they aren't as sturdy as I had thought they would be. My ornaments, that I am storing, are a little smaller than each compartment so they roll around a little. But, so far, I am storing them in the bedroom closet where it is dry. It would have been nice to find a plastic container to store them in. Any suggestions? Rated 4 out of 5 by LizaLou from Holds so much more than I realized! I've used this for Christmas ornament storage, but it could be used for any holiday, hobby, or craft storage. Acid-free is a great feature, and I love being able to open the box and see everything on one level. (Dumped my old storage because there were times I wanted something on one of the lower layers in a 4-layer box, would have to remove multiple layers of ornaments in all the compartments. Ugh!) I am wondering whether they're made sturdier enough for long-term use and shelf-wear as I get them in and out over the years, but I've just bought them so I'll have to see how they do over time. They do look great on the shelf! Rated 3 out of 5 by amacord from Indoor Ornament Storage These are nice boxes if you are planning to store your Christmas ornaments in a moisture-free/pest-free location (not an attic, garage or basement). We have the larger size and they hold many ornaments in a compact space. I like that they are archival - though the cardboard itself nicks easily. I wish more inserts were provided with the box - I felt that the individual cells/ compartments were rather large. Also, I think they are rather expensive for what they are - I was expecting more from something that calls itself "The Best Christmas Storage Box Ever ". Still, they suit our purposes, and I would recommend them with some reservations. Rated 4 out of 5 by nuthatch from Use archival box for many purposes Upset that the Container Store was only selling archival quality boxes for ornaments, I took a walk around the display isle to calm down. And, of course , I realized that all I had to do was take the dividers out of the box to use it for my purpose. Now some of my textile collection resides nice and flat in an archival box. Maybe someday the Container Store will sell archival boxes without the dividers a little more inexpensively? can the compartments come out entirely? Yes, they can come out entirely. Also, they are adjustable to make compartments different sizes even though these boxes are ordered by the number and size of compartments they contain. Will this box protect against termites? It's great that these are archival, but what about pest protection? Thanks. The Archival Ornament Storage Boxes are made of high-density acid free chipboard but are not specifically treated for pest protection. For additional protection, you can place the Archival Boxes inside larger acid-free plastic boxes. We recommend storing them away from extreme temperatures and high humidity in a climate controlled closet or room inside your home; refrain from storing them in an attic or a basement. Which of your storage containers will fit these boxes? Our Archival Ornament Storage Boxes are designed to store Christmas and other special occasion ornaments and seasonal decor. Is this box buffered or unbuffered? Our Archival Ornament Storage Boxes are made from buffered material. Can I buy additional cells to add to these boxes? Additional dividers for our Archival Ornament Storage Boxes are not available. Our Archival Ornament Storage Boxes are available with 12- and 28-Compartments. The number of bulbs that can be stored in a each compartment depends on the size of the ornaments being stored and the quantity of protective packaging used around them. Will the two other sizes of boxes get restocked? The medium (16 compartment) and large (12 compartment but only 5&quot; deep, the ones listed are 6&quot; deep) be restocked? I bought a bunch here last year but now you only list the small and xlarge size boxes. Our Archival Ornament Storage Boxes are currently available with 28-Compartments that measures 16&quot; wide x 21-3/4&quot; deep x 3&quot; high and with 12-Compartments that measures 16&quot; wide x 21-3/4&quot; deep x 6&quot; high.